It seems my sense of loss and longing and loneliness always connects to looking west, to the setting sun, the long shadows coming from that direction. This is a connection made during my childhood on the Iowa farm, and it continues to this day as I look west from the big red house in Fairwater. Always something to do with the far horizon and with the disappearance of the sun. By contrast, dawn - with its own glow and long shadow, its own horizon - suggests possibility, fullness, some rich refreshment of the spirit. Same sun, same sense of horizon, but in the other direction. Then, too, it is autumn which invokes in me longing, loss, and loneliness, a whole season of sundown. And it is out of this loss and longing and loneliness that my poetry arises, I think. As poets we need the solitude, but we also need the hunger for what is lost or what lies just beyond our reach. A rich lyricism may rise from loneliness, engendered by our trying to find beauty wherever it might be seen in our lives. to know of winter's pain. J.D. Whitney, Sweeping the Broom Shorter. 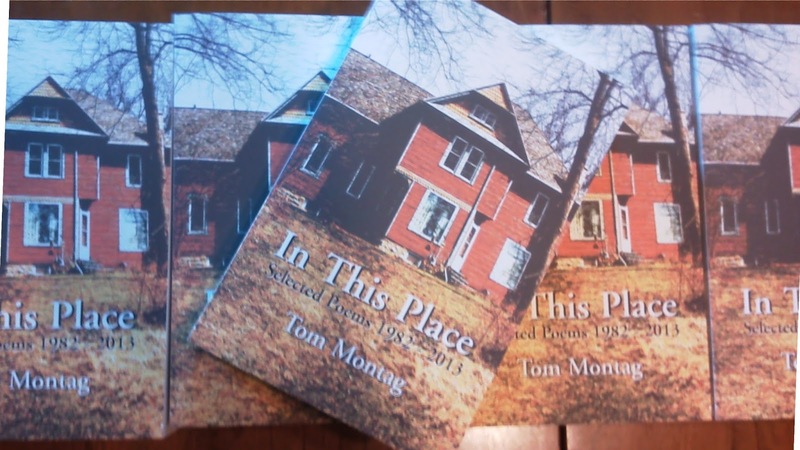 Longhouse (PO Box 2454, West Brattleboro, VT 05303), $15 + $2 shipping. One could, if he wished, remark on the range of materials that Whitney chooses to handle - from the personal to the tribal to the mythic; from the lovely to the unlovely; from the torn and broken to that made whole. I would rather point to the constant in his work across all his years of writing -- the line, the voice, the ear. What is it that makes these poems? The break of the line, the way the voice pauses before going on, the way the form of the poem is the poem while the content is like coffee in the cup -- strong, black, what we take with us while the cup remains. What Whitney does in his Sd poems (1973, 1988, 1990, 1995) he does in all his poems, the tall, skinny tumble of words down the page -- tumble is not the right word, for the arrangement is at once casual and perfect. Robert Creeley's skinny lines come to mind, yet Creeley is not so exact. Robert Lax comes to mind, and Larry Eigner. William Carlos Williams. Has Whitney found the American idiom that Williams sought. Yes, I think he has. Not the American idiom, for there is not one single speech for all of us, just as there is no single English language for all its speakers. He has found his American idiom, and we are blessed for it. We trust Whitney's ear. We trust his eye. His line. If you wish, you can read some of my earlier remarks on Whitney here and here. 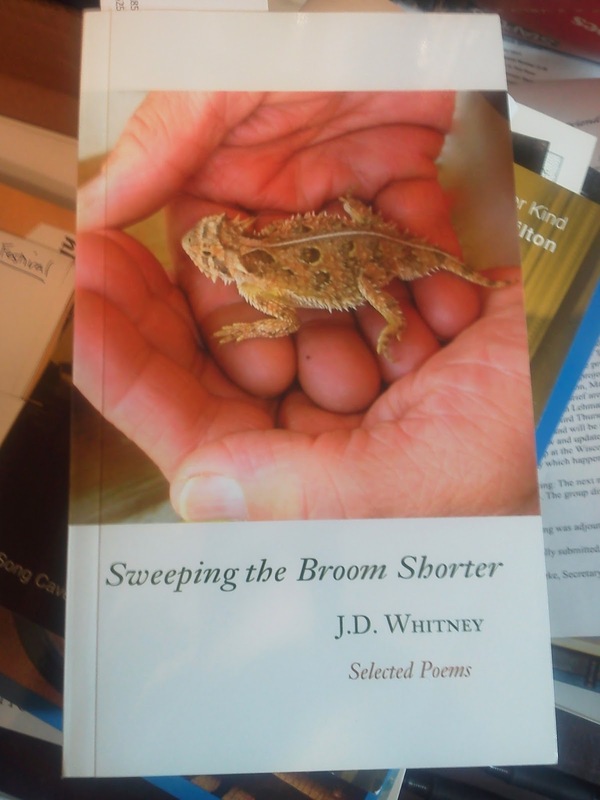 Suffice it to say: Sweeping the Broom Shorter should be on every poet's bookshelf, and on the bookshelf of anyone else who says he or she loves poetry. Peter Stephens at Slow Reads has just published a long and loving comparison of my work to that of painter Andrew Wyeth. The comparison of In This Place: Selected Poems 1982-2013 to Wyeth's painting astounds me, for some years ago, when I was at the Museum of Modern Art in NYC, I turned into a small alcove (photo here) where the only thing hung was Wyeth's "Christina's World." It was if I had been clubbed. I stood transfixed, pulled in, caught. One of my companions said afterwards: "Tom, I saw you go into that painting. I didn't know if you were coming back out." Peter's words humble me. Thank you, Peter.